No, no, no, not back-to-school –though that’s true as well — I’m talking about CIFF! The Calgary International Film Festival is back for another season of drama, suspense, mayhem, laughter, and plain ‘ol naughty fun. This year, I’m delighted to be volunteering for the fest as an official blogger. It’s very exciting, and means that I get to preview a number of films so I can blog about them and get you all as interested in Global film, Documentaries, Canadiana, and the rest, as I am. 1. Tell me about yourself — your name or Twitter handle, whichever you prefer to share. You can tell me where you’re from and what you do, too, if you’d like. 2. Is this your first CIFF? If yes, what enticed you to come? If no, what keeps you coming back each year? 3. 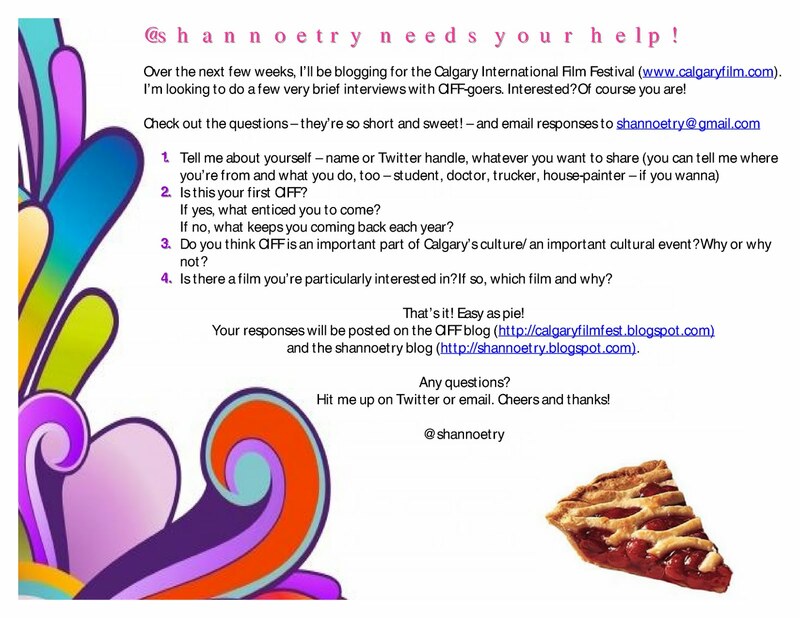 Do you think CIFF is an important part of Calgary’s culture/ an important cultural event? 4 Is there a film you’re particularly interested in? If so, which film and why? You’re welcome to answer questions in the comments below, or email shannoetery@gmail.com. Your responses will be posted here and on the CIFF blog. Questions? Want to expand your interview a bit? Hit me up on Twitter or email.